A horrific accident put Justin Mundt's vision in peril. But despite his severe injury, quick assessment and care at Mayo Clinic preserved Justin's sight. During the summer of 2016, Justin Mundt was taking care of repairs around his house and fixing a garage door opener. The routine task took a dreadful turn when the tip of his screwdriver snapped off. It flew into his right eye and penetrated his cornea. The accident caused what doctors call an open-globe injury — a severe eye trauma that results in a full thickness laceration of the eye. But the swiftness with which his Mayo Clinic providers examined and treated Justin's eye saved his sight. "Talk about dodging a bullet," says Justin, who lives in St. Charles, Minnesota. Injuries like Justin's that fully penetrate the eye are among the most severe seen by ophthalmologists. "A patient is at a high risk for an infection inside the eye or detachment of the retina, either of which can lead to blindness," says Gavin Roddy, M.D., Ph.D., a physician in the Department of Ophthalmology at Mayo Clinic's Rochester campus. "Anytime we have a so-called 'open-globe' injury, we need to act promptly in order to reduce the risk of those two dreaded complications,"
Not only did the rapidity of Justin's care preserve his sight, his vision is now exactly the same as it was before his ordeal: 20/20 with corrective lenses. "We are very grateful, and he is very fortunate that, despite an open-globe injury, his outcome was 20/20 vision," Dr. Roddy says. "That's pretty exciting to us. Some people with these types of injuries can have significant vision loss or even loss of the eye itself." When the tip of the screwdriver hit his eye, Justin instantly realized something terrible had happened. "It wasn't very painful, but I lost vision in that eye immediately," he says. "I put my hand over the side of my face. I could feel the jelly-like fluid on my cheek, and I knew it was bad." Justin ran inside the house and told his fiancée that he needed to get to the hospital right away. Thirty minutes later, they were in the emergency room at Mayo Clinic Hospital — Rochester, Saint Marys Campus. Throughout his emergency room experience Justin kept his eyes closed. But he remembers staff rushing to assess the damage. Ophthalmologic surgeon Elena Bitrian, M.D., was contacted, and in under an hour Justin was learning about the delicate operation he was about to have. "As soon as we confirmed the injury, we booked the operating room," Dr. Roddy says. In the meantime, a clear, plastic shield was placed over Justin's eye to provide protection for the eye until surgery could be performed. "We put the shield in place, mobilized the operating room staff and prepared for surgery," Dr. Roddy says. "Then we started the operation as soon as logistically possible in order to reduce the risk of complications." For Justin, waiting was the most difficult aspect of the event. "The worst part was thinking about the possibility that I could lose my eye or the ability to see out of it again," he says. During the four-hour operation to repair Justin's eye, his surgical team was exacting in its mission. "We confirmed in the operating room that it was, in fact, a full-thickness corneal and scleral laceration that required suturing," says Dr. Roddy. "We cleaned up the area and re-approximated the damaged tissues, so the wounds could be closed." 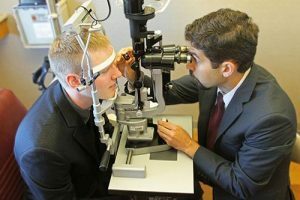 Justin Mundt, left, is examined by Gavin Roddy, M.D., Ph.D., of the Mayo Clinic Department of Ophthalmology, after a severe eye injury. The surgical team placed 11 sutures into Justin's eyeball to repair the damage. They also worked to restore the fluid component of his eye. "The eye is constantly making fluid, called aqueous humor, and the eye constantly drains fluid, as well," Dr. Roddy says. "In many cases of open-globe injury, the eye must be re-inflated during surgery to replace some of the fluid lost in the injury." When surgery was complete, bandages and a second protective shield were placed on Justin's eye. For several weeks, he was required to keep his eye protected with eyeglasses or a shield. Justin maintained a strict regimen of bandage changes and eye drops. "We needed to periodically remove the bandages, pry open the eye and apply eye drops," Justin says. "After a while it just became routine to put drops in every four hours and keep it lubricated." Initially his eye was clotted over with blood and, even during brief bandage breaks, it was difficult to see. But to his great relief, Justin's vision slowly came back. "At one of the checkups, they cleaned up the eye, and my vision started to return," Justin says. "After a few weeks, they were able to remove five sutures from the cornea. The sutures caused irritation on the inside of my eyelid. After they were removed, the swelling went down, and things started returning to normal." 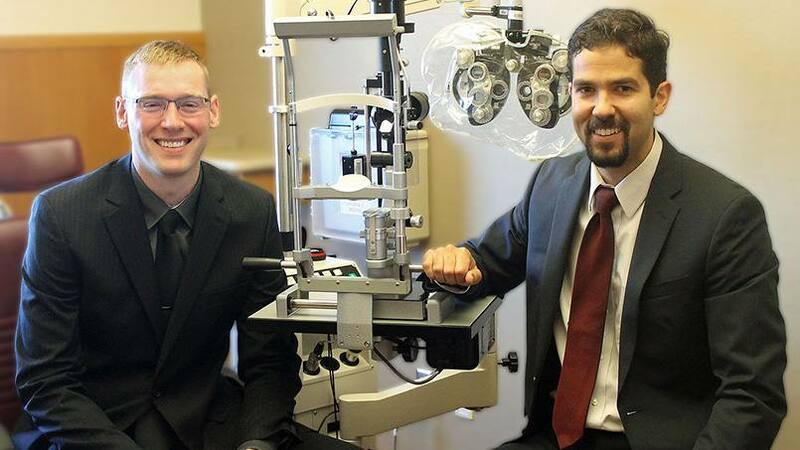 Having nearly lost his sight, Justin says he is much more mindful now about having it. "The accident has given me a new appreciation for my vision," he says. "It's definitely made me more thoughtful and careful about what I do." His ordeal has also given him an increased awareness of and gratitude for the men and women who cared for him. "I owe a huge thank-you to everyone who was involved. It was a frightening experience, so I appreciate everyone who stepped in and stayed up all night with me to get things fixed," he says. "Every minute I was at Mayo, I was completely satisfied with how I was treated. I hope that those involved realize the positive impact that they have on their patients' lives. I'm so grateful for what they've done for me to help preserve my eyesight." Learn more about Mayo Clinic's Department of Ophthalmology. Read tips to protect your vision from Mayo Clinic. Connect with others talking about Eye Injury and Vision Disorders on Mayo Clinic Connect. So thankful to Dr. Roddy and Dr. Bitrian and the whole Ophthalmology Surgical Team for saving Justin’s vision!